US President George W Bush has nominated Deputy Defence Secretary Paul Wolfowitz for the post of president of the World Bank, a key global development agency. Mr Wolfowitz's reputation as a tough Pentagon hawk has divided global opinion. Here are a selection of key reactions from around the world. talents, insights, and energy, and I will miss his daily counsel and friendship. The enthusiasm in old Europe is not exactly overwhelming. He is a man without international development experience, without professional qualifications. 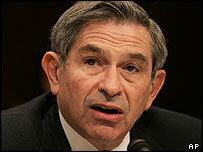 I have known Paul Wolfowitz personally and professionally for a long time. He is a person of high intellect, integrity and broad experience in both the public and private sectors. A truly terrifying appointment. You can't have a situation where rich countries lecture developing countries about democracy and then aren't prepared to exercise democracy in this kind of appointment. [He has] an impressive record of public service with extensive experience of management and of international affairs, in particular in Asia and the Middle East. I will look forward to working with him. The appointment is another provocation from the US administration and the neo-conservatives to the Third World, especially the Arabs and Muslims. It's a proposal. We shall examine it in the context of the personality of the person you mention and perhaps in view of other candidates. Paul Wolfowitz is very distinguished and experienced internationally, and if his appointment is confirmed we look forward to working with him. I'm not positive with the choice - it's going to rub people up the wrong way... [But] he could be a lot better than the initial reaction to the labels that have been attached to him. He could prove over time to be a very important and good leader of the World Bank. It makes you wonder whether all the administration's words about mending fences with our allies are just lip service. A good proposal, but there may be others. There are people of great value. As well as lacking any relevant experience, he is a deeply divisive figure who is unlikely to move the Bank towards a more pro-poor agenda.